Ignore diacritics / diacritical marks. Formatting sensitive matching (eg: find all bold text). Preserve or replace formatting in matches. Whole word matching (to ignore matches inside words). Replace matching case (preserve uppercase vs lowercase). Save and load frequently used expressions. Search scopes to control where matching occurs. For example: search a whole file, or just its comments. Find matches may be opened as a results list, in a separate floating window, to aid in scanning through a document. Clicking any single match will jump to the content in the document, showing it in context. Search through all open documents and see a results list summarizing all the matches. Advanced searches are made easy by our PowerFind feature, which shows friendly descriptive phrases you use to build your search patterns. Find all 5 digit numbers, find just capitalized words, or find all words ending in "ing" that only occur at the start of a paragraph. If you can describe it, Nisus Writer can find it! 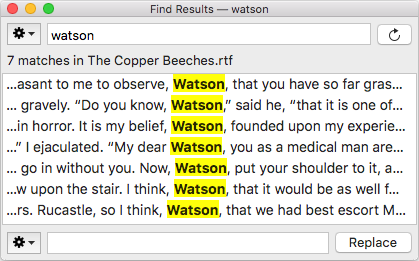 Use the Formatting Sensitive option to combine text search patterns (PowerFind or regex) with formatting requirements. For example, find all text that's blue and underlined, or find all paragraphs using the Heading 1 style, etc. 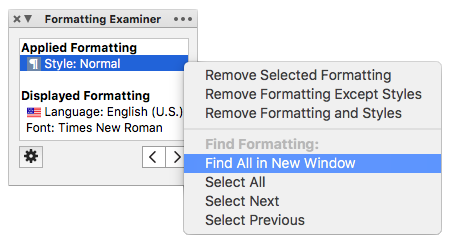 Nisus Writer makes formatting searches even easier with our Formatting Examiner palette and other tools. 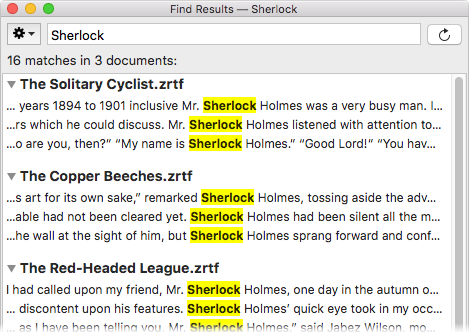 Instead of using find patterns you can use simple commands like "Select All in Style" to match text based on existing formatting. Read more in our user guide's help topic about Find and Replace.